�����The attitude among dealers for this last month of the year appears to be more positive in nature. 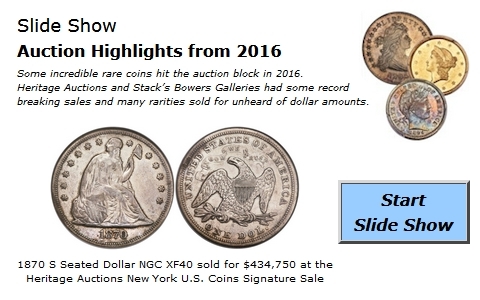 Activity at most recent shows has been very competitive and the holiday season always brings additional jewelry and bullion sales. Most dealers are gearing up for the annual FUN Convention January 10-13; otherwise, travel for most is minimal at this time of the year unless it is for family get-togethers. �����This week's Moderns Wholesale Market Dealer Price Guide displays sporadic changes throughout the charts. Modern Lincoln Cents exhibit some increases for high grade coins with some renewed interest in adding particular dates to active collections. Most of the increases are a result of sales to Registry collectors. The 1948 D in the MS67 Red is now up to $350 Market; the 1962 Red Ultra Cameo in PR69 jumped to $625 and the 1964 in the same grade increased to $160. �����The charts for the Modern Bullion coins are generally lower in the latest issue. However, in the Eagles chart there are a variety of $25 Gold coins that continue to rise. They have very low mintages and supplies are not so plentiful. The following dates are higher this week. �����The coming year will present a lot of challenges for everyone. However, we are in a great business to address some of these challenges. This will be our last E-News for 2012. We would like to wish everyone a Happy Holiday Season and thank you for your continued support.